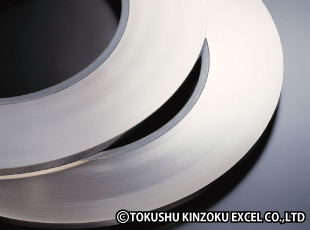 Carbon Tool Steels (SK2, SK4, SK5, SK6, & SK7) | TOKUSHU KINZOKU EXCEL CO.,LTD. Springs, spiral springs, knitting needles, horns, measuring tapes, washers, dot printers, spacers, and various plate springs. Due to their workability, hardenability, product performance, affordability, and other characteristics, carbon tool steels are the most widely used cold-rolled special steel strips. Carbon tool steel is used in a wide range of fields from hard applications including blades, cutting tools, and regular tools to applications that require elasticity and toughness including regular springs, spiral springs, knitting needles, horns, measuring tapes, and washers. An overview of carbon tool steels (SK2, SK4, SK5, SK6, and SK7) and carbon steels (S15C, S45C, S50C, S55C, and S60C) is provided for the purposes of reference and comparison on the Special Steels and Carbon Steels page. It is common to heat treat most SK grades before or after processing. Tokkin's SK grades are designed to produce optimal surface roughness after heat treatment, which enables an ideal product finish after black oxide treatment. Cold-rolled special steels are normally supplied as rolled (with a rolled finish), but we can supply products with finishes ranging from the softest annealed finish to the hardest full-hardened finish. This allows you to select the finish best suited to your requirements and application. To check hardness only, refer to the Hardness Chart for steel grades. 1. While a rolled finish is sometimes used for bent products, we normally use an annealed or skin-passed finish for such products. 2. Steel strips generally have directional properties. As products with a rolled finish in particular have strong directional properties, it is better to avoid bending parallel to the rolling direction. It is therefore necessary to think of a layout that will ensure that the bending direction is perpendicular or cross to the rolling direction. 3. After cutting, shearing, or processing, if a bend is made so that the burred surface is on the outer face of the bent section, cracks may propagate from the burred edge. Therefore, the burred surface should be positioned so that it is on a section that will not be bent, or the burrs should be removed before bending. 4. When bending, spring back differs according to the extent of processing and finish of the material. It is necessary to make appropriate corrections depending on the shape and processing method. 5. Bendability differs according to grade and processing conditions, but it is possible to process materials with different finishing conditions as shown below. Except for minor drawing processes, the product usually needs to have the same drawability for all directions. For this reason, products with an annealed or skin-pass finish are used. Even though cold-rolled special steel strips are not susceptible to significant stretcher-strain marks in the way that soft steels are, they have a low drawing limit. Therefore, when deep drawing, we perform intermediate annealing, and then re-draw the product. We use a drawing rate of 0.4 for drawing a regular flat sheet and 0.6 for re-drawing. Almost all cold rolled special steel strips are quenched and tempered as appropriate depending on the application. (3) to choose a quenching method that will minimize quenching deformation. When performing heat treatment, the temperature of the heat treatment furnace is measured and used as the temperature to which the material is heated. However, sometimes there may be a large difference or variation between the material’s actual temperature and the measured furnace temperature. It is therefore necessary to thoroughly investigate temperature properties, and control the temperature and alter the heat treatment process accordingly. When treating cold rolled special steel strips, the higher the carbon content, the easier decarburization occurs. In particular, the risk becomes greater in in high-temperature heating processes like quenching. If the material is contaminated with dirt or foreign substances then high temperature corrosion may occur. Therefore it is necessary to pre-treat material surfaces by cleaning them and adjust the atmosphere of the furnace before heat treatment. RX gas is used as a standard furnace atmosphere during quenching, NX gas during tempering, but N2, H2, AX gases, and others are also used. In some cases, neutral salt-bath furnaces, metal bath furnaces, furnace tubes, cases, and other equipment is used to ensure that the material does not come into direct contact with the air. In most cases, a value around the midpoint of the quenching temperature range in the table above is used as the quenching temperature. This temperature is maintained for anywhere from several tens of seconds to several minutes depending on the material grade, dimensions, shape, required properties, and quenching method. Quenching conditions have a significant influence on the properties of the product. If the quenching temperature is too high or is maintained for too long, grains become larger, toughness is reduced, and the risk of decarburization increases. On the other hand, if the quenching temperature is too low or is not maintained for long enough, the product does not harden and soft spots may occur. It is therefore important to select appropriate quenching conditions. Normally oil or water is used to cool materials down. Water-quenched products harden better than products oil-quenched products, but are more susceptible to problems such as quenching deformation and cracking. For this reason, except in some special cases, oil quenching is used for cold-rolled special steel strips. To avoid quenching deformation, the oil temperature is increased and martempering is performed. In special cases, quenching is performed in a salt bath or metal bath (austempering). For ribbon shapes or simple shapes, stool quenching, press quenching, and other methods are employed. Refer to the table above for quenching temperature. In spite of their hardness, quenched materials lack toughness and are brittle. To be finished into materials that possess toughness and strength, they must therefore must be tempered. Tempering conditions are determined depending on the required properties of each material by considering test results, the steel grade's quenching and tempering properties, and other factors. For cold-rolled special steel strips, long tempering time is used for certain cases (particularly when toughness is required) because the amount of material used is small and tempering work is often carried out consecutively. However, it would seem that most manufacturers often use a short tempering time of no longer than a few minutes. Moreover, due to the nature of the consecutive tempering process, if time is short then the temperature is set a little higher and products are tempered repeatedly. However, as a general rule, materials that are tempered at low temperature for a long time have more toughness than those that are tempered at high temperature. Care is therefore taken to avoid making the tempering furnace shorter, the tempering temperature higher, and the tempering time shorter than necessary. Using an oil, metal, or salt bath for tempering makes it possible to reduce time compared to open-air tempering. 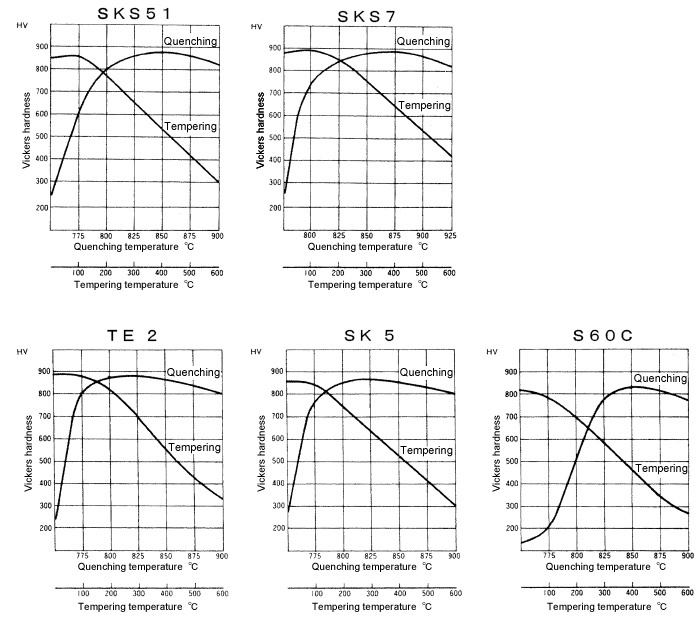 Quenching and tempering properties for common steel grades are shown in the graphs below. Materials are annealed to soften them or remove deformation. In such applications, the appropriate annealing temperature is 600ºC–700ºC. If the temperature is too high, the structure can be changed and decarburization or scaling may occur, so it is generally preferable to select a temperature on the low side. A temperature of 600°C–700°C is maintained for anywhere from a few minutes to 30 minutes, after which the material is cooled gradually to around 200°C. It can be left to cool naturally when the temperature is 200ºC or below. Charts profiling special steels, carbon steels, and carbon tool steels.